1. What does Shinzen Kai mean? Shinzen Kai means friendship club. We teach Danzan Ryu jujitsu, a martial art founded by Okazaki Seishiro, aka Henry S. Okazaki. See the history page for more information. 3. Do you belong to any national or international organizations? Shinzen Kai is a full member of the American Judo & Jujitsu Federation, the largest promoter of Danzan Ryu jujitsu in the world. All of our students must belong. 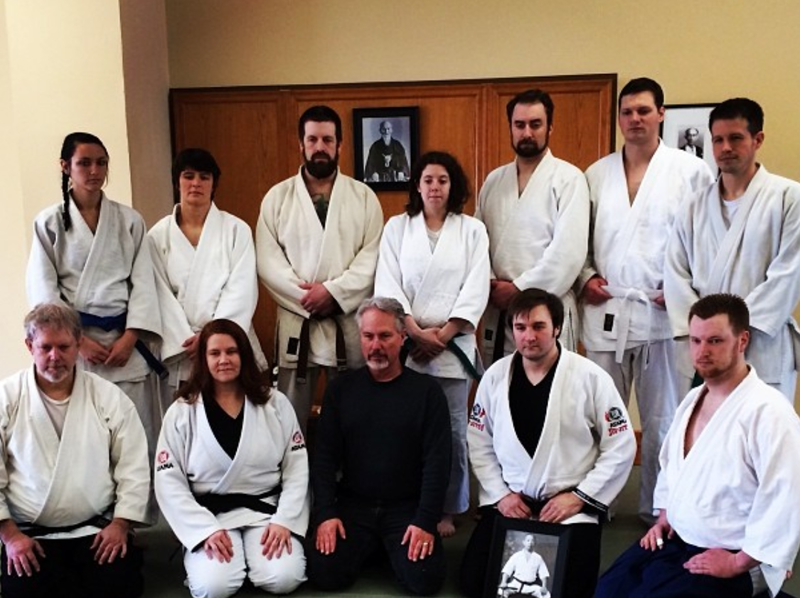 In addition, the chief instructor is a member of Aikido of Minnesota dojo and the World Aikido Aikikai organizations. 4. How does Danzan Ryu differ from Brazilian jiu-jitsu? Danzan Ryu is a complete martial art that includes throws, pins, strikes, kicks, self-defense tactics, nerve attacks, strangulations, healing, and restorative massage (seifukjutsu). Brazilian jiu-jitsu shares many of these aspects but largely focuses on ground fighting. 5. What's the difference between judo and jujitsu? Judo is an Olympic sport with rules. There are no rules in jujitsu. Judo also refers to the philosophical underpinnings of Danzan Ryu. Flexibility of mind, spirit and physical forms are believed to be the most effective and humane. Kokua is a Hawaiian term meaning service in community. It's similar to friendship, but implies a deep commitment to others. 7. What does your logo mean? The characters on the left mean Shinzen Kai. The graphic on the right shows nage and uke (training partners) engaging one another, as yin and yang, but within the greater circle of their community. The arrows indicate the eight directions of kazushi (off balance). The red "chop" at the bottom is the stamp Prof. Okazaki used for his own dojo, Kodenkan, or school of the ancient tradition. The outer circle represents.zanshin (remaining mind/spirit). 8. Why do you maintain Japanese traditions, such as calling the instructor sensei instead of "sir," and bowing? We teach a Japanese martial art with influences from China, Hawaii, the United States and even Spain. We preserve certain Japanese traditions to honor those who developed Danzan Ryu and its precursor arts, and who have passed this training on to us. Within ritual, there is freedom. 9. When can I start training? Come to any class and fill out the forms provided. Wear loose clothing, preferably a judo or jujitsu uniform (called a dogi or gi, for short). 10. What is the minimum age for training? We teach an adult class for those 16 and up. For children under 16, we would be happy to recommend classes in other martial arts with qualified, excellent instructors. We don't teach young kids because of the level of physical and psychological maturity required for Danzan Ryu.